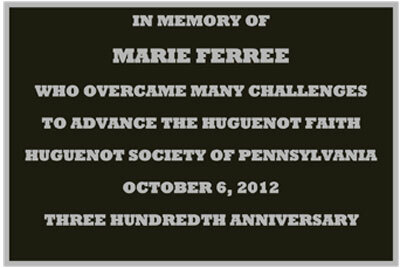 On Saturday, October 6, 2012, the Huguenot Society of Pennsylvania placed a bronze plaque on the tombstone of Madame Marie Ferree marking the 300th anniversary of her arrrival to the Pequea Valley in 1712. The following article appeared in "My Pequea Valley News" on October 8th, 2012. Several people turned out on Saturday morning in Paradise for a special ceremony at the gravesite of Marie Ferree, a woman who many said "overcame many challenges to advance the Huguenot faith". 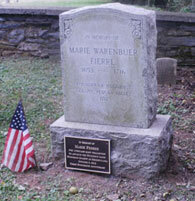 The Jean Ribault Chapter of the Pennsylvania Huguenot Society dedicated a plaque in honor of Ferree on her tombstone in Carpenter Cemetery to mark the 300th anniversary of her arrival to Pequea Valley in 1712 and to recognize her contribution to the Huguenot movement in the United States. The society, which meets twice a year at Pequea Evangelical Congregational Church in Gap, promotes the cause of religious freedom and preserves the history of Huguenot settlers in America. Ralph Shank, one of the members of Paradise Township's 300th anniversary committee, said Ferree was the first person to be buried in Carpenter Cemetery in 1716. At that time, the cemetery faced Carpenter's Hall, a two-story building where dances were held. "She wanted to be buried there so she would be overlooking her valley," he said. Lydia Freeman, president of the Huguenot Society of Pennsylvania, said members of the society discussed placing a plaque on the grave when they learned that Paradise Township was celebrating its 300th anniversary. 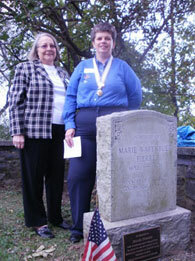 "We felt it would be a great way to dedicate to Marie, who was a big part of this area's history," said Freeman. "This is a great honor for the Ferree family." One of the many challenges Ferree overcame when coming to America, said Freeman, was being a single mother of six children. "The Huguenots were persecuted for their religious beliefs from France and feared for their lives," she said. "They could either flee the country, or stay and be killed." Many Huguenots came through Germany and then settled in the United States, said Freeman. "Some changed their names," she said. Dennis Groff, a Paradise supervisor, said the township was "thrilled" to be a part of the ceremony and plaque dedication.